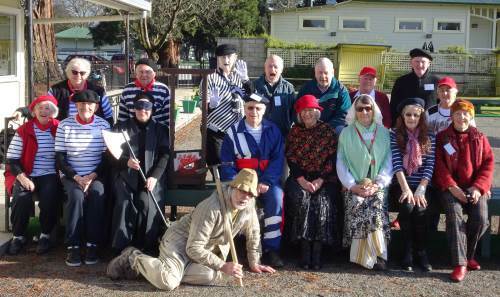 Last week the Masterton Pétanque Club held a Bastille Day Mêlée with local members and visitors from Manawatu, Upper Hutt and Turangi. A very successful day enjoyed by all who participated. Players arrived in Bastille Day dress and the French National Anthem was played at the start of the day with French music played throughout the day. Prizes were fiercely competed for with first prize being awarded to Barbara Johnston from Masterton. Patricia Galbraith from Turangi came second with Graeme Morris a close third. John Clark (front) won the best dressed outfit. The Wellington team to play in the Southern Tri-Star tournament (25-26 November) has been named. Steve Frampton (Kapiti), Yvonne Futcher (Wanganui East), Marc Khull (Manawatu), Kevin McFadgen (Kapiti), Trish Smart (Manawatu) and Alan Taylor (Kapiti). The Coach is Graeme Morris (Masterton). Fourteen teams took part in the inaugural Premier Pétanque tournament in Otaki last weekend. Based on Lawn Bowls Fast Fives, the Triples games are played in 2 sets of 5 ends. If each team wins a set then a tie-break single end is held to determine the winner. A set will be drawn if the scores are tied after the five ends. In addition, each team may nominate a Power Play end each set (before the start of the end). In a Power Play, the team will score double points. 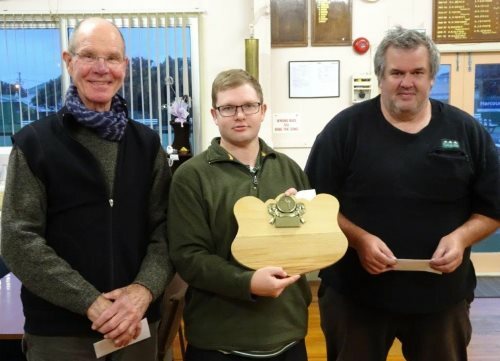 The inaugural Premier Pétanque Triples was won by the Manawatu team of Kevin Bryan, Alan Cameron and Vaughan Husband. It is hoped to run the event again next year. Manawatu’s first Cup defence was away at Otaki. They started well, winning both the opening Singles and Doubles games. In the second round, Manawatu again won the Singles and Doubles to lead 4-2. Otaki rallied in the final round, picking up another Triples win and their first Doubles game to close the gap. However, Manawatu prevailled once again in the Singles to retain the Trophy 5 games to 4. Manawatu’s next defence is at home to Silverstream. The annual match between the Auckland and Wellington development teams is in progress at the Manawatu Pétanque club. Each team comprises twelve players, split into six Open players and six Senior (over 60) players. Note: Senior players may be included in the Open team, but not the other way round. The match is played over nine rounds, with the teams playing two rounds of Singles and three rounds of Doubles on the Saturday and four rounds of Triples on the Sunday. One match point is awarded for each Singles win, two match points for each Doubles win and three match points for each Triples win. There are 108 match points in total and the winning side is the first to reach 55 match points. The Singles games was shared 12-12. In the Doubles, Auckland won 13 games to 5 to hold a 38-22 lead at the end of the first day. With 48 match points available in the Triples, both sides are still in with a chance. Auckland needs to win six Triples games and Wellington needs to win eleven games. (There are sixteen in total).